Twitter, Twitter, Twitter. Once again the micro-blogging platform rears its ugly head, potentially putting someone’s career on the line. EA Senior Engineer Bob Summerwill took to Twitter today to start a little mini rant against the Wii U. Speaking to Scott Hanselman, who simply asked a question, Summerwill took this opportunity to vent about some of the Wii U’s shortcomings, namely the lack of games on the console since the beginning of this year (though that could change). He kicked off his tirade with “The Wii U is crap. Less powerful than an Xbox 360, poor online/store. Weird tablet. Nintendo are walking dead at this point.” The tweets have since been deleted. But IGN has screencaps of them for the public to see. This comes as mounting suspicion grows regarding the relationship between EA and Nintendo. EA revealed that their Frostbite 3 engine was incompatible with the Wii U due to performance issues. All future EA titles would be using the Frostbite 3 engine, meaning no EA games on the Wii U. Yet, they got the engine to work with the 360 and PS3. They’re modifying it to work with iPads. Some just want EA to stop the BS and just say that they just don’t want to work with Nintendo, albeit a little more nicely, or simply say nothing at all and stop putting up thinly veiled excuses. While there might be some truth to his words, the delivery of Summerwill’s message has the potential to become a PR nightmare for EA and hamper any current or future partnerships between them and Nintendo should the state of the Wii U improve. 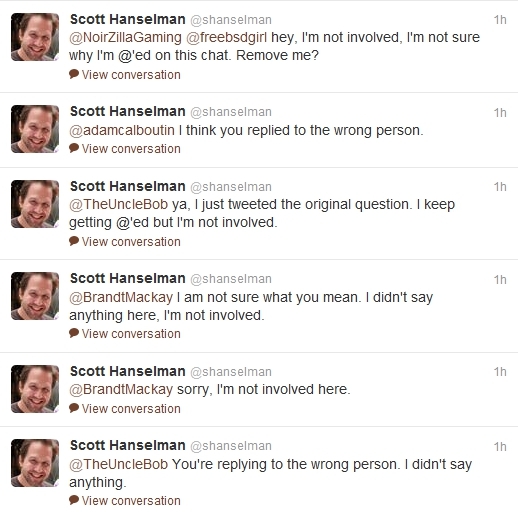 The unfortunate side effect of Summerwill’s tirade is that people think Scott Hanselman, the one who initially asked the question, made the tweets and believe he’s the one talking down the Wii U. As a result, a lot of rage has been misdirected towards Hanselman when it should actually go towards Summerwill. This entry was posted in Gaming News and tagged Bob Summerwill, Bob Summerwill tweets, ea, EA Senior Engineer, Electronic Arts, nintendo, The Wii U is crap, wii u on May 17, 2013 by Steven T..